Tom is hard at work on a new textbook for WWNorton. I'm helping him when I can. But yesterday was such a gorgeous day that I finally went out for a two hour walk from 3:30 to 5:30. When I walk through the streets of Paris, I am free. I don't carry a handbag. I have a little wallet with my drivers license, two credit cards, some money, and a card that has our address and phone number written on it. My clothes don't have pockets. The wallet is on a chain (the kind some people used to use for keys, other people use them as pull chains for ceiling fans and lights). The chain is looped around my bra, and the wallet is tucked in safely in the middle of my bra. The key to the apartment is a thick, brass thing. I keep it on a safety pin, just inside my wasteband. My hands are free. I don't carry a map because on walks like these, I don't need one. Well, my hands aren't exactly free. I carry the camera. Only the camera. My hair is loose. I never put it up in a french twist or in a ponytail anymore. I wear comfortable Rockport walking sandals. I stride along, keeping an eye out for a good image. When I find one, I might stop and take a picture. An easy, direct walk over to the 6th arrondissement leads me to the boulevard St. Germain. I made it to the St. Germain des Pres church in one hour. 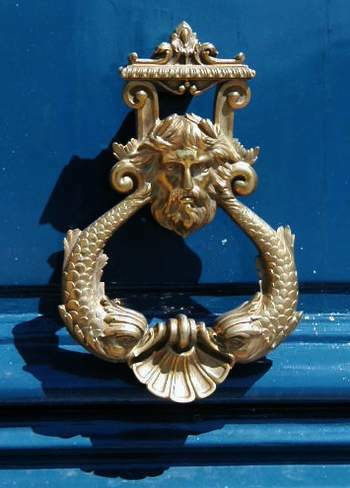 Along the way, I saw this nicely polished door knocker on the Colombian Embassy on rue de Constantine (upper left). And here is the church of Saint-Thomas-d'Aquin (left) that I mentioned on July 9. 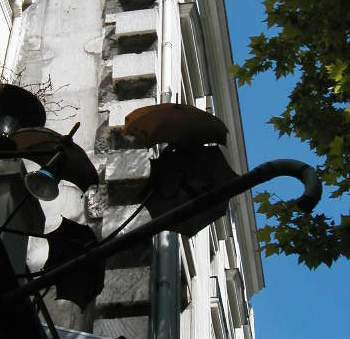 It is situated at the end of a very short, narrow street off of boulevard St. Germain in the 7th arrondissement. The street opens into a piazza in front of the church. That piazza, as well as the architecture of the church, gives the feeling of a piazza in Rome or Venice. 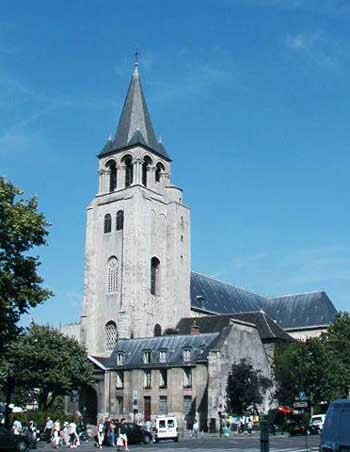 Saint-Thomas-d'Aquin was built for the commoners in the fauborg St. Germain. 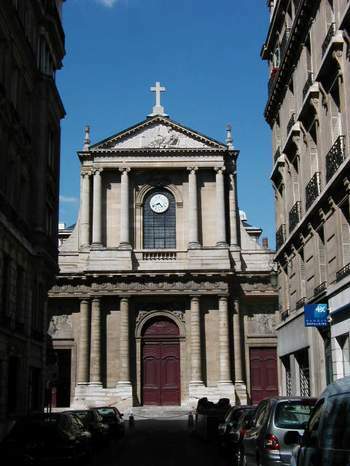 It soon became too small and the church of Sainte Clotilde had to be built to accommodate the abundant commoners. Rue Saint Dominique was blocked off at rue de Constantine. Lots of serious-looking guards were glaring at everyone who walked by. Somebody very important must have been at the Ministry of Defense yesterday. 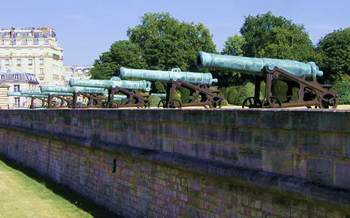 At left, cannons in front of the Hotel des Invalides. Near the beginning of my walk, I helped an old Chinese man find his way. He spoke and understood no French or English. He couldn't speak at all, because of a stroke, I guess. But he seemed to understand pantomime. He had a piece of paper with three lines of Chinese characters. In between these lines, in block letters, were the French/English equivalent phrases. The first line was "Tour Eiffel Tax Free Duty Free." The next line was "La Motte Picquet." And the final line was "Avenue de Suffren." 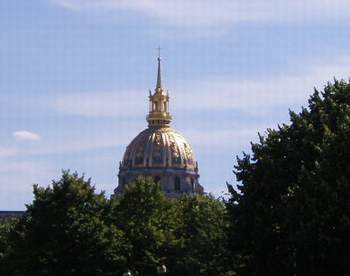 Dome of the Hotel des Invalides, above, and the trees in front of the Hotel, below. He approached me, making a small noise in his throat. He held out the paper, and pointed to the line at the top. I did not know of, nor do I ever remember seeing a duty free shop on La Motte Picquet, which was the avenue we were standing on at the time. He pointed up the the air with both arms outstretched. Then I knew he really wanted to know where the Eiffel Tower was. So I told him in French and English (who knows, maybe he could understand one or two words), using gestures, that it was straight ahead, but at the trees, it was a turn to the left. That seemed to satisfy him, and I went on ahead. But after I crossed the intersection of Avenue Suffren, I became concerned. What if he got lost again? What if someone tried to take advantage of him? So I turned around. I saw him on the other side of Avenue Suffren, asking a young man the same thing he asked me. The young man pointed up Avenue Suffren, then over to the right. One could indeed get to the Eiffel tower this way, but one would miss the splendid approach up the Champ de Mars. I decided to go walk with him. He was pleased to have the help. When we got to the rue de J. Carries, I gestured that we should turn right. But just at that moment, he saw something ahead that he recognized. He suddenly knew where he was, and he gestured a "thank you" and "goodbye." So I went on, a bit confused, but now I realize what had happened. He is most likely the father or grandfather of people who run the Tour Eiffel Tax Free Duty Free Shop on Avenue Suffren. He goes out for walks, and frequently gets lost. A family member made up the piece of paper with the three lines of text in Chinese, interspersed by three lines in French/English, so that he could use them to ask strangers for directions. 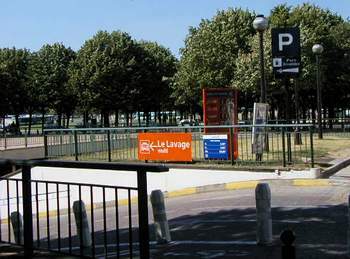 La Motte Picquet is included because that is the nearest metro station. He can read the Chinese, but not the French/English. So he points to the line directly under the Chinese line that he wants to use. He knows people may not know where the shop is, but he gestures upward, like the tower itself, to indicate that he wants to know where the tower is. Almost anyone could help him with that. Once he sees the tower, he knows he can find the family's shop. 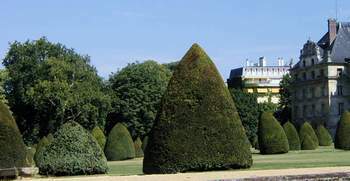 Even though we could not yet see the tower where we stood on Avenue Suffren, because of the trees and buildings, he did see something familiar on the street and therefore was no longer lost. How brave he is, to venture out like that with his limited ability to communicate. Or, maybe he actually is gifted at communicating. 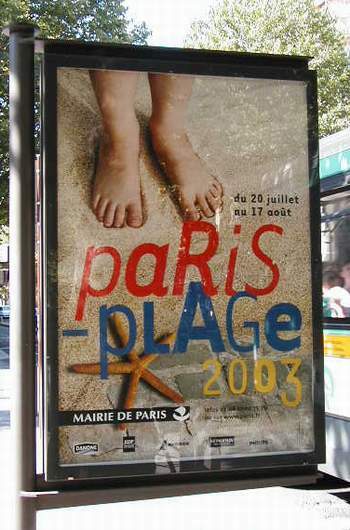 At left, one of the many billboards promoting the Paris Plage (Paris Beach), due to start up tomorrow. At left, a sign composed of metal umbrellas marks the entrance to an accessories shop on the boulevard St. Germain. Speaking of shopping, I've been trying to find dental floss lately. I tried at the G20 and Franprix groceries. There I found lots of different kinds of toothpaste and toothbrushes, but no dental floss. I decided to try Monoprix this morning. I could have gone to a pharmacie instead, but I reasoned that the pharmacie would have only one or two types and both would be overpriced. Monoprix had an entire side of one aisle loaded with the biggest selection of toothbrushes and toothpaste I've ever seen anywhere. One peg, only one peg, in the entire aisle was empty. It was in the upper right corner of that side of aisle. Empty. I read the tiny print on the label on the wall behind the peg. "Fil dentaire" it said -- dental floss. Gone. Disparu. Non plus. The St. Germain des Pres church, above. I could not believe it. Dental floss was the only thing out of stock on that aisle. I turned to the other side. There was a special display of Mercurochrome Laboratories products. It included one type of dental floss. I grabbed it and made a dash to the cash register. I had to pay 3.35 euros for it -- about $4. Next time I'll try the pharmacie. We had dinner last night at good old Oh! Duo. Last time we were there, we had quite a discussion with madame about the low-carbohydrate diet that we're on. So, this time, after she describe the daily special (filet mignon de porc served with tagliatelles), I asked her if it was possible to get the pork with vegetables instead of pasta. She said "epinards, bien sur." So, each of us had a nice pile of buttery spinach with our pork. I also had the escargot with tomato, Burgundy-style. This is an excellent dish if you like escargot and want to try a different sort of preparation -- something besides the usual butter-and-garlic treatment. Tom had the shrimp salad, served with some pieces of citrus. Very nice. We were appalled that there was only one other couple in the place besides us! Oh! Duo's regular clientele of locals are gone on vacation. Finally, toward the end of the evening, a very tall and extremely handsome man and his dog came in to eat. The guy looked like Mel Gibson (but wasn't). He was THAT handsome. It is unusual to see very tall people here. My readers who have never lived in a huge city may wonder where people go to buy gasoline or get their car washed in a place like Paris. Central Paris certainly does not have American-style gas stations -- at least, there are very, very few. Mostly, the gas stations here are associated with parking garages. 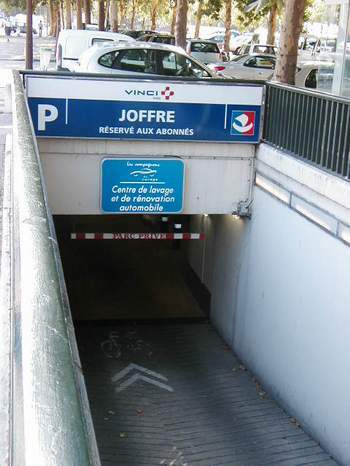 Often, these are underground garages like the one at left under the Esplanade des Invalides. And here's another one, at left, under the Champ de Mars. Both of these garages offer gasoline and car washes. Out of sight. Good idea. It is going to be very hot here today -- 90 degrees F, according to Yahoo Weather. The heat has been almost unbearable in the south of France. There are bad fires destroying a huge area in Var, a region in the very southeast corner of the country. 1200 pompiers are working on putting out the fire. Last week, there were bad storms in Bordeaux, injuring a number of people. A few have died from their injuries. Elsewhere in France, Lance Armstrong is still in the yellow jersey, but if he wins, it is not going to be such an easy victory this year. Tom is watching the Tour de France results at the end of every day. We'll keep you posted.